There are a huge number of cribs on the market today. From round to sleigh, iron to hand painted. How do you know which is the best baby crib for your baby? On this page you can investigate the different crib types available, including details about who makes them and where to buy them at the best prices. Some places offer discount baby furniture sets - a great option if you're on a budget! You will also find important crib safety and crib recall information, as well as, everything you need to know about crib mattresses. Find out how to choose the best baby crib for your little one. There are many factors to take into account when you are choosing your baby's crib. Is the crib convertible? Is it safe? Does it suit your nursery style? Will it be convenient to use? This article will walk you through everything you need to consider to make sure you choose the best crib for your baby. There are many different crib types to choose from. Which one is best for you will depend, among other things, on your personal taste, your budget, and the size of your nursery room. Each one is available in various styles and finishes and from a number of different manufacturers. Brands differ in terms of price, quality, safety standards and warranties, as well as distribution methods. 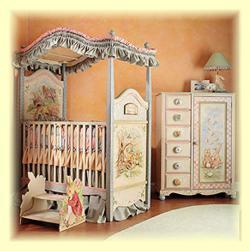 Higher prices are usually due to the quality of materials used and the extent to which the crib has been handmade. The most common and popular crib type; standard cribs come in a variety of styles and finishes to suit any baby nursery. Find out all about the classic Jenny Lind crib, including who makes these elegant spindle cribs and where to buy them. Perfect for the vintage or shabby chic nursery. Round cribs are a good option if you are looking for something a little different. They give baby a 360 degree view of the world and they look stunning. Similar to the standard crib but made of metal rather than wood. These oh so elegant iron cribs come in the popular round shape too and are very popular with the celebrity moms. Also known as the 3-in-1, 4-in-1 or Lifetime crib, the convertible crib is a sensible long term investment that can be used all the way through until your little one leaves for college. If you have a small baby room, mini cribs are a great way to help make the most of your space. Find out about your best options here. Of all the baby beds your little one will sleep in over the next few years, his first small bed will probably be his favorite. After nine months inside you small cribs are a home away from home for baby. Baby bassinets are like baskets on a stand. They usually have a hood and are decorated in the most beautiful, frilly fabrics. Baby cradles are basically tiny cribs on a rocker. They are made of wood or iron making them heavier than baby bassinets and moses baskets, and therefore less portable. They are often passed on as heirlooms and are a wonderful traditional baby furniture item. Baby moses baskets are exactly what they imply - a small woven basket usually lined with pretty fabric. Most have handles for carrying from place to place and some have the added benefit of a hood. Moses baskets are small enough to be placed in your baby crib to help in the transition from a small bed to the real thing - a big deal for your baby! The Amby bed is a hammock that hangs from a spring. It provides baby with the natural elements of closeness and motion experienced during the nine months of pregnancy. The Arms Reach Cocoon moves automatically in response to your baby's movement mimicking the motion of the womb and rocking your little one back to sleep. The bedside crib is a cosleeper that attaches to the side of an adult bed. It allows your baby to remain close to you at night without actually being in your bed. Baby has the benefits of sleeping near you, without the risk of you rolling over on him or her. This is your first priority. Babies spend 60-70% of their first year in their crib. It's up to you to make sure they sleep safely. It is essential to ensure that the crib furniture you decide on, meets the Consumer Product Safety Commission (CPSC) standards for crib safety as an absolute minimum. The crib is one of the few places you will leave baby alone. Follow these crib safety guidelines to make sure your precious baby's sleep is safe and snug. Check any portable crib you intend to buy against these portable crib safety standards. A portable crib will keep your baby happy while you travel, but they can be dangerous. How can you prevent SIDS? Safe sleep advice for your baby. SIDS prevention information not to be missed! This report covers recalls of all full-size cribs, crib mattresses and crib bedding. Recalled cribs result in several deaths every year - every time I see a new one I get the chills. Make sure you check your crib out against this crib recall report before you put your baby in it! Need a crib mattress? Learn the difference between natural and synthetic, innerspring and foam. What to look for and where to buy crib mattresses. Make sure your baby has a safe, comfy sleep, by following these crib mattress safety guidelines. Your crib is only as safe as the mattress you put in it. Wood baby cribs are warm. Iron baby cribs are stylish. Information to help you decide which crib finish is best for your baby nursery. Do you have a baby crib or furniture item that you have absolutely fallen in love with? We would love to hear about it! Send us a review to add to the baby furniture section of this site to help other parents to find the BEST baby stuff for their little ones. I hope the information on this page helps you to find the perfect baby crib for your baby nursery. When you've chosen one, head over to the baby nursery furniture section to find out everything you need to know about outfitting the rest of your baby's room.